The Big Wobble: Southern, eastern Europe and the Balkans plunged into a dangerous heatwave from southern Spain to Hungary as temps rise above 40 deg C! Southern, eastern Europe and the Balkans plunged into a dangerous heatwave from southern Spain to Hungary as temps rise above 40 deg C! A huge swathe of southern Europe, eastern Europe and the Balkans, stretching all the way from southern Spain to Hungary has been hit with a menacing dangerous heatwave with temperatures creeping above 40 deg Celsius or around 105 deg F.
The temperatures are to stay through the week with locals and tourists alike being told to keep hydrated and to stay out of the sun. 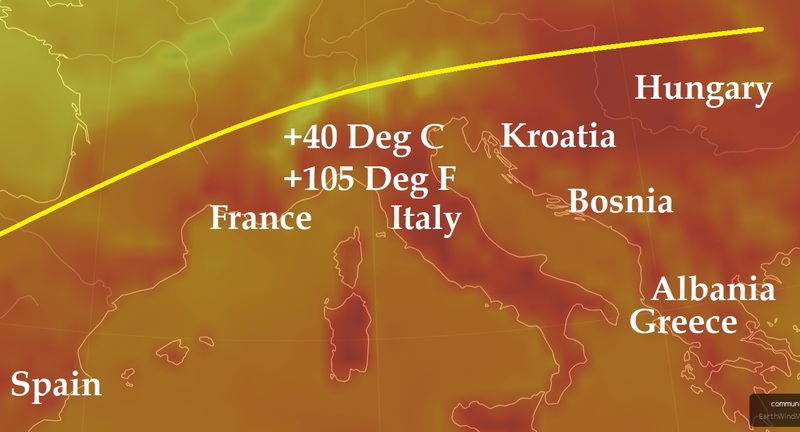 According to Severe Weather Europe; follow up on the current intense heat wave across the Mediterranean, parts of central Europe and the Balkan peninsula. Today, another extremely hot day is expected as temperatures are locally already well above 35 °C and expected to rise into upper 30s and into low 40s range during peak time hours this afternoon. Max afternoon temperatures yesterday reached up to 40 °C in SE France, central Italy and S Spain again while extremely hot and near record-breaking values were observed along the eastern Adriatic coast with over 42 °C in the city of Split, Croatia!